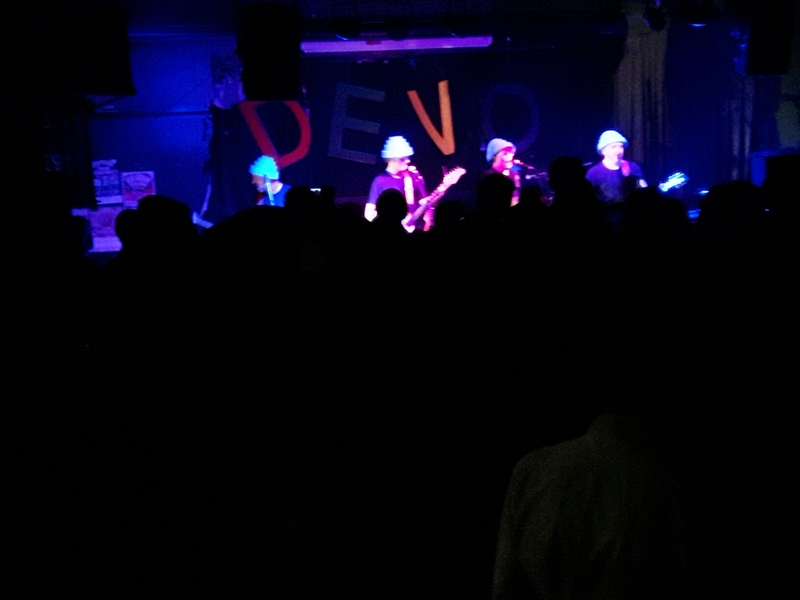 WE ARE NOT DEVO! YOU’RE NOBODY IF YOU HAVEN’T GOT A TRIBUTE BAND! !! Very very much the proverbial bone of contention the subject of tribute bands, there must be thousands upon thousands just in great Britain alone, the world over must be millions, you either love or hate them,I’m guessing Elvis Presley is the most popular, fat elvises, thin elvises, Japanese, Pakistani, Jamaican, mini elvises, or are they impersonators? ??? Is it a fine line between tribute and impersonator? The Bootleg Beatles doing massive tours celebrating 30 Years of being the Beatles for 2 hours a night! Certainly a job for life, that’s 4 times longer then the Beatles career. A few years back i read a great interview with bruces foxton, when asked why he started to tour as “From the jam ” his answer was simple “I’m playing new stuff to 50 people a night, whilst down the road the jam tribute band THE JAMM are playing to 800 people at a tenner a go” so it’s a no brainer for bruce. 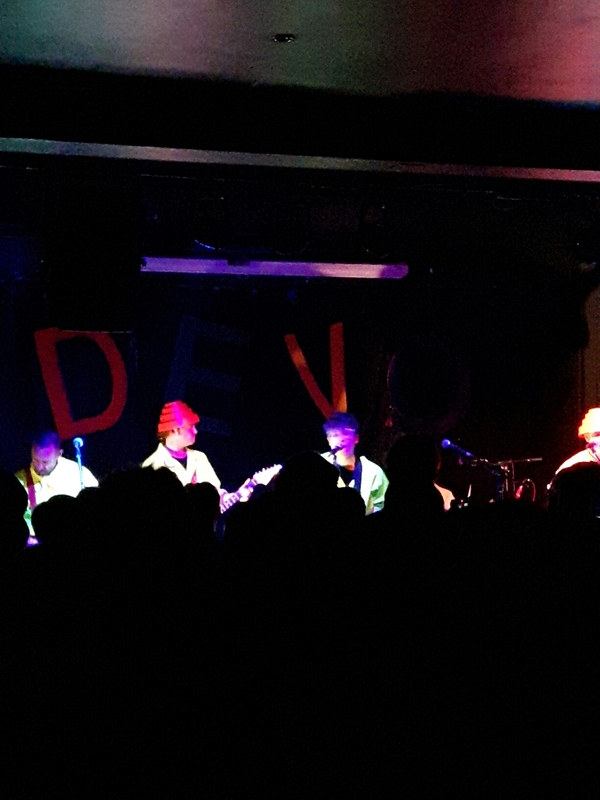 So that brings us to Are We Not Devo, I’ve been told they are one of only two devo Tribute bands in the universe, for those not aware of devo they formed in the mid 70s in akron ohio USA, gradually becoming part of the punk /new wave scene of the late 70s early 80s, crafting a sound totally unique and also creating a great stage show and great imaginary to go along with each and every release. 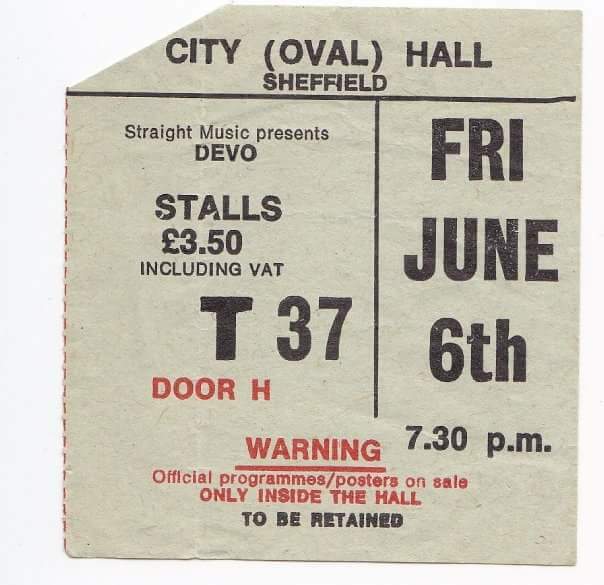 I was lucky enough to see Devo back in 1980 or 81, I’m not sure which year it was, I will have to do a quick “Google it” here’s my ticket from said concert above, as per usual my rather poor memory just about recalls the end of the gig as we were pitched into total darkness and a giant babies head appeared on the equally huge backdrop speaking rather slowly and quite scarily as well, the booji boy! 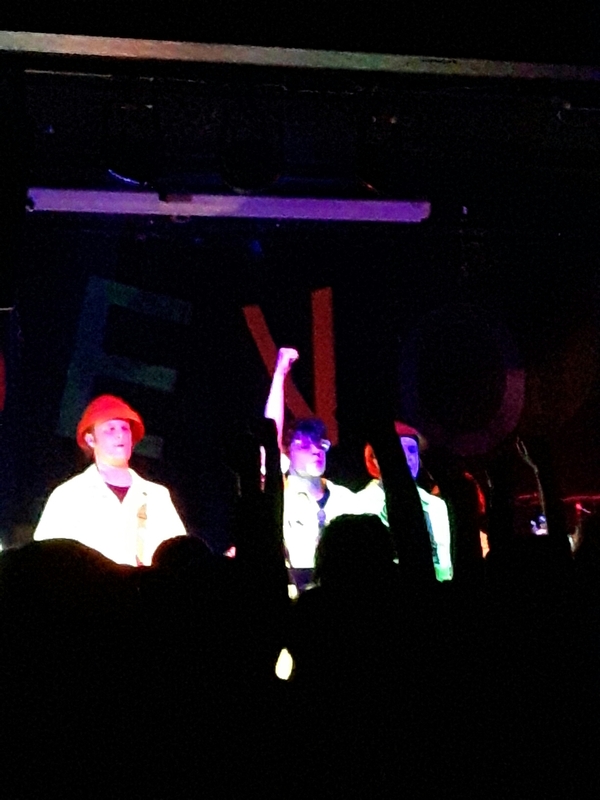 A Couple of months back i was having a quick skim through twitter or Facebook and came across a few photos from the yellow arch studios of a band looking a bit like devo, further reading and it looked like a collective thumbs up from the masses who had sung along, danced along,cheered for more and had a spiffing good night of rock and roll, searching a bit more on Twitter I found there page and they where “tweeting ” another gig at the greystones,tickets online or the old school way of passing a hard earned crumpled tenner over the counter and receiving a nice real proper printed ticket without a booking fee via cafe#9 in nether edge thank you Mr SG oh and nice cafe by the way. It’s a great little venue is The Backroom at The Greystones, bit of a trek from the city centre but well worth the effort, a packed room greets the band as they bounce onstage and take up the classic devo pose,legs wide everyone stands straight and looks towards the audience and they launch into a set of devo classics sounding incredibly like the original, but putting there own Mark on a lot of these classic songs, from (my poor)memory we had Gut Feeling,Come Back Jonee,Sloppy,Uncontrollable Urge,(I Can’t Get No) Satisfaction, Praying Hands,Mongoloid,Jocko Homo.Of course we had Whip it, and very good it was to! Energy domes bouncing around on stage and off stage all adding to a great atmosphere, here we had a band playing all these songs with great enthusiasm and clearly with a love of the akron legends , you did them proud! ! Encores and It all ended to soon, domes drained of energy that’s yer lot! 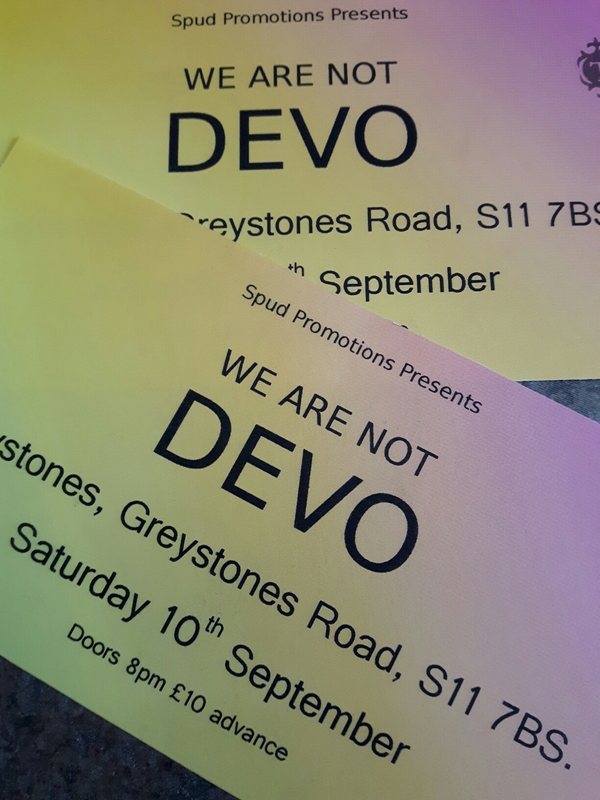 This was a great night and I’m sure we will be back for the next appearance, I throughly recommend you see them, forget all the other tribute bands these are the ones!